Automotive companies are joining up with tech giants like Google, Uber, and prominent startups to develop the next-generation autonomous vehicles that will alter our roads and throughways and lay the framework for future smart cities. They’re harnessing technological advances such as machine learning, Internet of Things (IoT), and the cloud to accelerate this development. Eventually, all self-driving cars will employ a combination of sensors, cameras, radar, high performance GPS, Light Detection and Ranging (LIDAR), artificial intelligence (AI) and machine learning to achieve their respective levels of autonomy. Connectivity to secure and scalable IoT, data management and cloud solutions are also important to the mix, providing a resilient and high-performance foundation on which to collect, manage, and analyze sensor data. For both the self-driving cars and the smart roadway systems, endpoint telemetry, smart software and cloud are essential enablers. The onboard cameras and sensors on autonomous vehicles collect vast amounts of data. There’s a lot of local data processing that occurs in real time, including the computations necessary to keep the car in its lane. Beyond the specific components, such as scalability of cloud computing infrastructure and intelligent data management there is a need for redundancy for mission critical systems, including power sources. There are redundant battery solutions employed that have different voltage ratings such as with 48V and 12V batteries. However, very few of these existing solutions provide redundancy for the same battery voltages as two 12V, 24V or 48V batteries. Up until now, that is. Clearly there is a need for a Bidirectional buck-boost DC/DC converter which can go between two 12V batteries. Such a DC/DC converter could be used to charge either battery and allows both batteries to supply current to the same load. Furthermore, if one of these batteries should fail, that failure needs to be detected, isolated from the other battery so that the other battery continues to provide power to the load without any disruption. 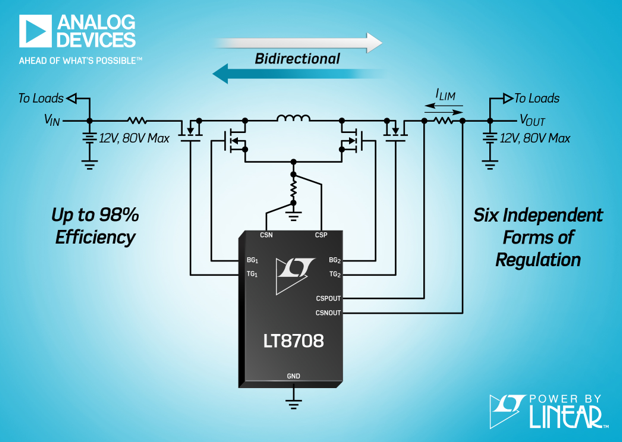 The recently released LT8708 bidirectional DC/DC controller from Analog Devices solves this critical function of allowing two batteries with the same voltage to be hooked up by utilizing the LT8708 controller. The LT8708/LT8708-1 is a 98% efficient bidirectional buck-boost switching regulator controller that operates between two batteries that have the same voltage, ideal for redundancy in self-driving cars. It can operate from an input voltage that can be above, below or equal to the output voltage, making it well suited for two each 12V, 24V or 48V batteries commonly found in electric and hybrid vehicles. The LT8708 operates between two batteries and prevents system shutdown should one of the batteries fail. This device can also be used in 48V/12V and 48V/24V dual battery systems. The LT8708/LT8708-1 uses a single inductor and operates over an input voltage range from 2.8V to 80V while producing an output voltage from 1.3V to 80V, delivering up to several kilowatts of power depending on the choice of external components and number of phases. It simplifies bidirectional power conversion in battery/capacitor backup systems that need regulation of VOUT, VIN, and/or IOUT, IIN, both in the forward or reverse direction. This device’s six independent forms of regulation allow it to be used in numerous applications. The LT8708-1 is used in parallel with the LT8708 to add power and phases. The LT8708-1 always operates as a slave to the master LT8708, can be clocked out-of-phase and has the capability to deliver as much power as the master. One or more (Up to 12) slaves can be connected to a single master, proportionally increasing power and current capability of the system. Forward and reverse current can be monitored and limited for the input and output sides of the converter. All four current limits (forward input, reverse input, forward output and reverse output) can be set independently using four resistors. In combination with the DIR (direction) pin, the chip can be configured to process power from VIN to VOUT or from VOUT to VIN ideal for automotive battery-powered systems. The block diagram (Attached to this entry) below shows the other parts required to complete the circuit for dual battery redundancy and safety in an automotive application. As shown the LT8708 works with two LT8708-1 parts forming a 3-phase solution design which can deliver up to 60A in either direction. Additional LT8708-1 devices can be added for higher power applications up to and exceeding 12 phases. The AD8417 is a bidirectional current sense amplifier that senses the current flowing into and out of the batteries. And when this current exceeds a preset value the LTC7001 high side NMOS static switch driver opens the back-to-back MOSFETs isolate either battery from the circuit. The LTC6810-2 monitors and controls the Li-Ion battery. It accurately measures the battery cells with a total measurement error of less than 1.8mV. 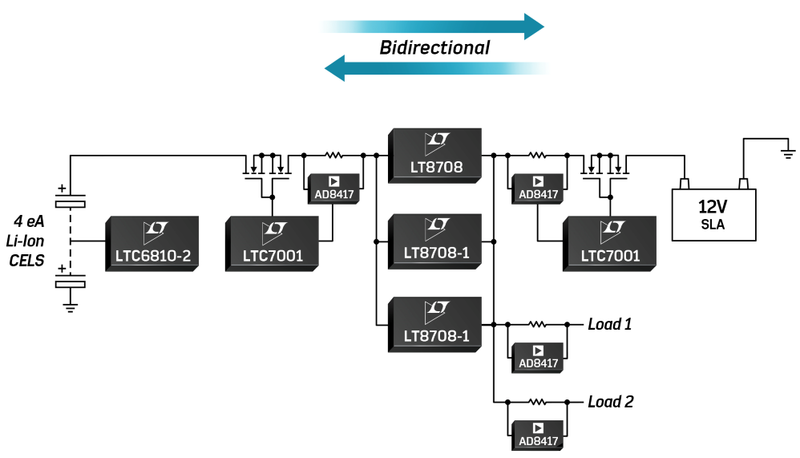 Multiple LTC6810-2 devices can be connected in parallel to the host processor used for additional redundancy to monitor other voltages within the circuit. Each LTC6810-2 has an isoSPI interface for high speed, RF-immune, long distance communications and supports bidirectional operation. The LTC6810-2 includes passive balancing for each cell, with PWM duty cycle control for each cell and the ability to perform redundant cell measurements. ISELED Automotive Smart LED, Inova Semiconductors	Model 2260 Series, Silicon Designs, Inc.